Next To Normal at ETC - Printer Friendly Page - On the Run - Theatre Port Houston - Theatre Auditions News and more! This ‘feel everything’ rock musical has earned accolades around the world for it tender, insightful, and funny portrayal of a family trying bravely to come to terms with life, love, and loss. NEXT TO NORMAL is about the seemingly perfect Goodman family. Their only problem is that sometimes mother Diana seems just a little too happy. Her husband Dan worries all the time. Their daughter Natalie is intent on getting a scholarship to Yale and leaving home. And their son Gabe, well…that’s another story entirely. Director Kim Mytelka has put together an amazing and mind-blowingly talented cast! This fantastic ensemble consists of Robin Cotton Cobb as Diana, Christopher L. Pool as Dan, Elizabeth Curtin as Natalie, Taelon Stonecipher as Gabe, Justin Gonzalez as Henry (Natalie’s classmate), and Brandon Del Castillo as Dr. Madden. 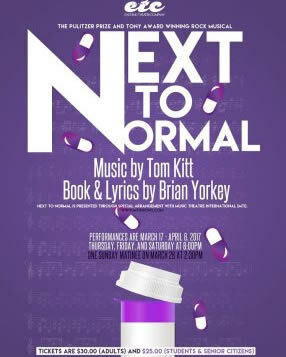 Performances for NEXT TO NORMAL will be March 17th through April 8th. Due to subject matter and some language, ETC does not recommend our production of NEXT TO NORMAL for children. TICKETS: $30, $25 Seniors & Students.